If changing your bed sheets and pillow covers is an easy way to add some newness to your bedroom, adding a unique ikat bedcover qualifies as adding spice to your bed life. 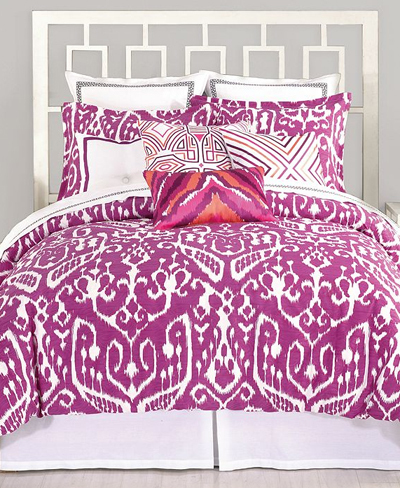 Gorgeous artisanal ikat quilts are taking bedroom interiors to a whole new level. Here are some beautiful examples of using ikat quilts to add some interest and spice to a traditional bedroom. Just a quick post to share some beauty and to reinforce a well known fact that most designers / architects / other creative minds used the Mother Nature as an inspiration for their work. Here is an example – while picking apples in the garden, I noticed how incredibly perfect this color scheme was - fresh, vibrant and very timely given the World Cup that just ended in Brazil. Years ago, while roaming in my favorite vintage fabric shops, I bought several meters of black and white polka dot vintage silk fabric. This silk fabric was later turned into a beautiful classic dress. During the last fitting, I was chatting with a tailor and a subject of caring for silks came up. I remember my tailor’s response to this day and, to be honest, really like it because it makes so much sense and it works. She said: “hand wash your silks in a cold water with a shampoo, preferably Pantene ProV shampoo, because a silk is like your hair and needs to be taken care of the same way”. Now if you like any other shampoo, go for it. As for me, Pantene has been my favorite for years and I did not question why Pantene and not something else. Before I get into a topic of today's blog may I just share my joy and tell you how happy i am that the new website has a blog? Now instead of explaining things in emails to specific customers I can just put my thoughts here for the whole world to read. So, the question of the day is how to care for ikat fabrics. Let me start off with a bit of history. 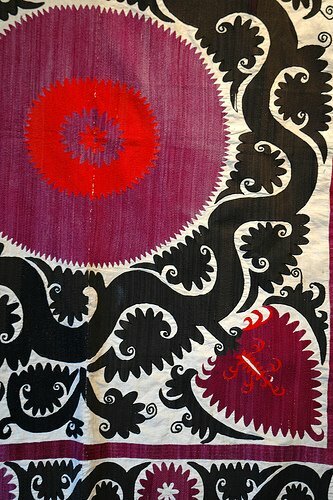 In 19th century, a silk yarn was as expensive as gold, ikat making technique was known to a few and the ikat garments were amazingly pleasant to wear. These were the days when the ikat textiles were only available to the richest and were considered to be a true luxury item. With time, the ikat makers thought of a way of making ikat textiles more, let’s say, democratic. They started combining luxurious silk yarns with a more affordable cotton fibers and created, so called, “adras” fabric. Adras is a beautiful and rich blend of silk and cotton fibers (usually around 50% silk and 50% cotton but percentages may vary). This brought the cost of the ikat fabrics down but by not that much – ikat fabric making still remained to be a highly manual process. This manual process involves a finishing step called “calendar”. The calendar finishing uses a mixture of egg white with a special glue which is evenly applied to a surface of a fabric and then pressed in calendar rollers. This process makes the fabric stiffer and glossier, adds a noble moire effect and serves as a protection against dust and dirt. 1) Colors may bleed – this is less likely with newer fabrics but there is chance of color bleeding. This is why when you wash ikats, make sure you hand wash them in a cold water with a mild detergent. 2) The fabric will lose its shape because the finishing white egg / glue mixture will wash off, moire effect will be gone and you will have a soft fabric. The fabric is still beautiful and it may be what designers are looking for to create that special worn and organic look. However, the washed fabric, in most cases will not work for upholstery, for curtains, for anything that will require the fabric to hold its shape. For these reasons, even though the care instructions for ikat fabrics are “cold hand wash with a shampoo” (I will tell you “wash your silks with a shampoo” story in a separate blog post), it is still the best to get your ikat products dry cleaned. Here at UzbekAlive, if we say that the fabric is washable, it only means “the colors will not bleed”. This week we have kissed good-bye to our old website and re-launched a new and improved UzbekAlive. In 12 years of business, this is our 3rd version of UzbekAlive. We are still ironing out a few wrinkles here and there. Otherwise, we are on a roll and working on bringing you ikat fabrics (ikat silk velvets anyone? ), a new line of pillow covers as well as new products in general. As always, we are one email away from you for custom-made designer items at nilufar@uzbekalive.com.